Almost 90% of the power you use when cycling on a flat course is spent fighting aerodynamic resistance. 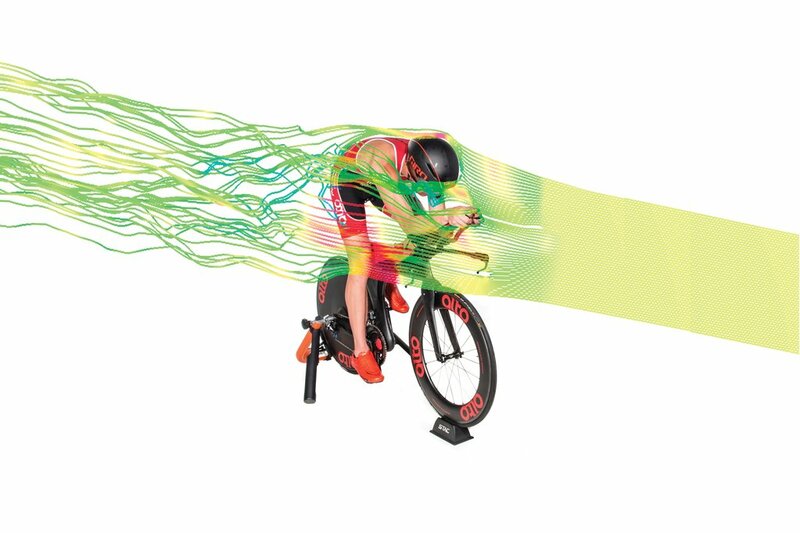 The revolutionary Virtual Wind Tunnel technology makes aerodynamic testing quick, affordable, and accessible anywhere. Now you too can become as aerodynamic as the professionals. If you want to get faster on the bike, there is no better value-for-money investment than a Virtual Wind Tunnel assessment. Watch the video below to learn how it works. 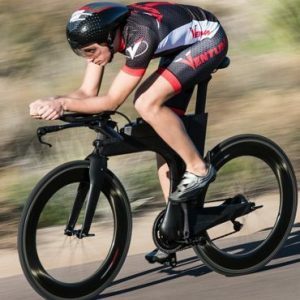 “Over the past year, I’ve been using the Virtual Wind Tunnel to optimize my position and inform my equipment choices for racing. My results were in close agreement with my data from a conventional wind tunnel, which validates this approach. When you ride a bike on a flat course, up to 90 % of your power goes to overcoming aerodynamic drag. Put simply, you're fighting the wind. With the virtual wind tunnel, it's possible to make improvements to your riding position, equipment setup or make equipment changes that can reduce your aerodynamic drag by 10 to 15 %. To be able to make such improvements, you must be able to test your aerodynamic drag. In the past, such testing has been very difficult or very expensive, or both. This changes with the Virtual Wind Tunnel. Testing in a real wind tunnel usually costs upwards of 1000$. The accessibility of wind tunnels is also very limited, so you may have to travel for it, and the process is time-consuming. Testing at a velodrome is cheaper (or free), but access may still be limited, and the process is time-consuming. The biggest issue is that it's difficult to get accurate results if you're doing the test yourself. Unless you are very experienced, it's likely that you'll make some critical measurement errors. The Virtual Wind Tunnel solves these issues. It's a much quicker and easier process than real wind tunnels and velodromes. It is very affordable, and you can easily replicate tests and compare results without the large risks of measurement errors from field testing. When comparing two different positions or setups, you can therefore find out how much faster you will be over your goal race in one position compared to the other. You can also find out the difference in speed at any given power output between your different tests. For example, at one riding position and 250 watts, your speed could be 42.6 km/h, compared to 44 km/h for another position. One of the best use case of the virtual wind tunnel is testing specific changes or alternatives in terms of riding position, equipment, or equipment setup. For example, you may find that switching from water bottles on the bike frame to a between-the-arms bottle and a bottle cage behind the saddle can save you 6 minutes over the course of an Ironman. Or that a more aggressive riding position could save you 15 minutes over an Ironman compared to your current position. Analysis of certain positions and setups can be analysed without needing to do a separate scan. This is called a "manipulation". 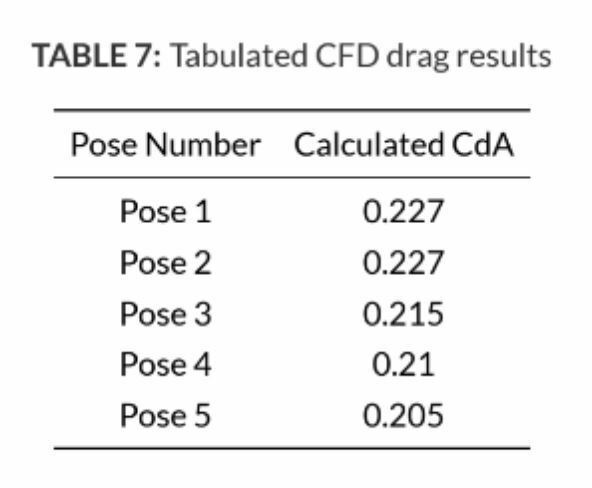 For example, you could ask to have two manipulations done of your baseline scan - one with changed arm angles and one with changed head position. All without having to perform or pay for a separate scan. Another example would be to compare different wheel profiles. You could do the scan with your standard training wheels, but through manipulations analyse and compare 30 mm, 60 mm and disc wheels. Note that not everything can be done through manipulations of a baseline scan. In general, changes that just require stretching the 3D model can be done, and simple equipment changes as well. 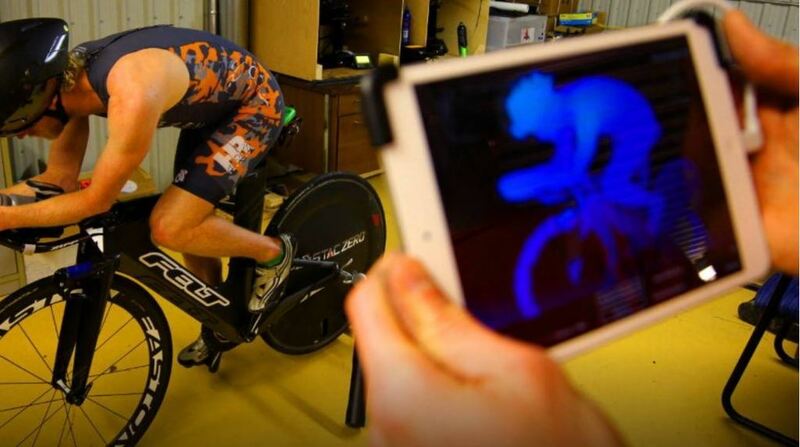 Athletes of all levels, from amateur to some of the best professional triathletes in the world are already using and benefiting from the Virtual Wind Tunnel. Age-groupers have set new personal bests or qualified for Kona, and professionals have won and podiumed at international races of the highest level. Some examples of professional athletes using the VWT are Cody Beals, Alex Vanderlinden, Amanda Bohlin, and Andrew Bolton. And more are joining the cause constantly! You will be sitting still on your bike indoors on a stationary trainer. 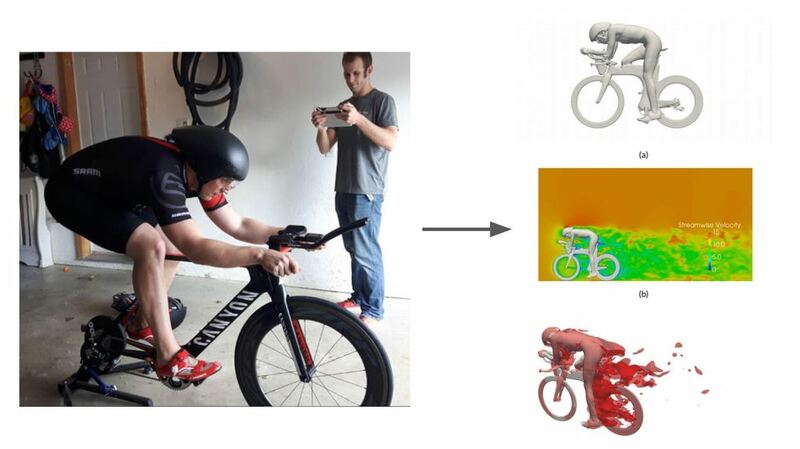 A digital, three-dimensional model of you and the bike is obtained by capturing images with a 3D scanner. This takes 2-4 minutes per scan. In some cases, a few different scans may be done. For example, when comparing different equipment setups or positions that can't be done through simple model manipulations in the analysis process. Advanced computational fluid dynamics analysis of the model then simulates how the flow of air moves around you and how much aerodynamic drag you’re creating. Analysis of certain positions and setups can be analysed without needing to do a separate scan. This is called a "manipulation". For example, you could ask to have two manipulations done of your baseline scan - one with changed arm angles and one with changed head position. All without having to perform or pay for a separate scan. Within a couple of days the analysis will be done, and the results (and optional full report, should you choose to order that) will be sent to you. Now you'll have data to back up which riding position or equipment change or setup is the most aerodynamic for you. And you'll know how much time this can save you in your next race. You'll know if your aerodynamics are currently good, bad or in-between. You can compare your results with a database of VWT clients, including both professional and amateur athletes. You'll even have the information needed to estimate how fast you'll be able to cover the race distance (assuming you know your realistic power target), which can help you set a time goal for the bike leg and the entire race. STAC Performance is in the processing of publishing a journal paper on this very topic, but they say that their own scale model wind tunnel testing has seen less than 1-2% uncertainty with the simulation results, tested over a range of air velocities and that they’re within 2-4% of full scale wind tunnel results. I'm not a fast cyclist or triathlete. Will I still benefit from this? Yes! For fast riders, a slight aero improvement makes a dramatic difference. Even tiny changes in your CdA/aerodynamic drag will generate a great wattage saving. But slower riders are out on the course for longer periods of time and wind hits them at a wider range of angles. So even a one watt reduction in aerodynamic drag over an Ironman course at low speeds can equate to up to a two-minute time saving. 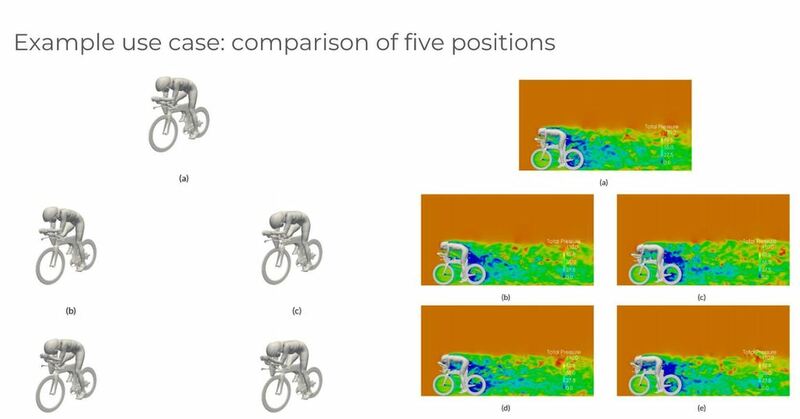 And in all likelihood, there is a lot more than one watt that can be improved upon in most slower riders aerodynamics. Therefore, aerodynamics is very important for both fast and slow riders. How long does it take to do the scan? One scan takes 2-4 minutes to complete, from when you're sitting on your bike in the testing position. If you want to do more scans at different positions and setups, factor in the transition time to e.g. move water bottles, or whatever you want to do for the following scans. The Computational Fluid Dynamics simulations performed to get your results requires some heavy-duty computing and calculations, but usually, you can expect your results within 48 hours. If you have several manipulations that you wish to complete, or many different scans, it may be safest to count on it taking an extra day or two. You can get scanned at Rua de Ponta Delgada in Lisbon, or I can come to any location that works for you in the greater Lisbon region. A small additional fee is charged if I come and visit you to do the scan. For larger groups or teams however, this fee can be waived. 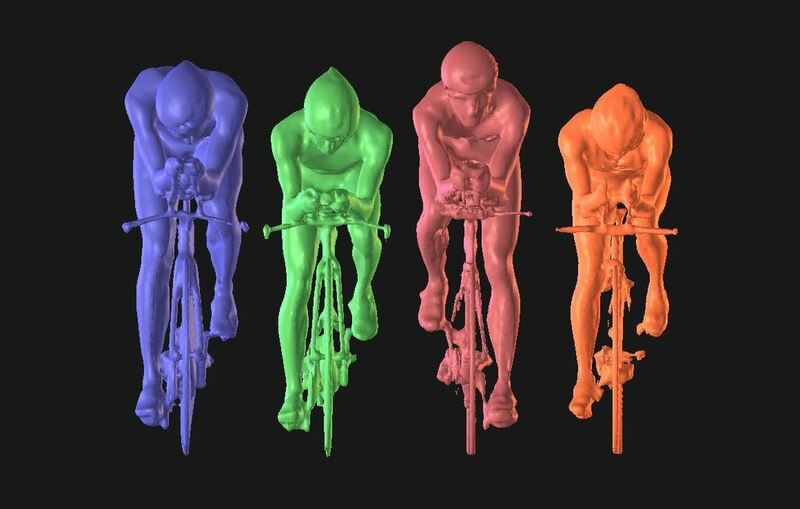 What are some examples of how much cyclists and triathletes can benefit from using the Virtual Wind Tunnel? 3-5 minutes by choosing the right helmet. There's no absolutely right answer as to what helmet is the most aerodynamic, it depends on the person and riding position. You can find the right type of helmet for you by comparing different options with the VWT. 10-20 minutes by adopting a more aerodynamic riding position (assumes a relatively poor starting point). With the VWT you can compare many different aerodynamic positions and no exactly how much faster one is compared to the other. This allows you to decide where your sweet spot for aerodynamics to power is. 5-10 minutes with aerodynamic wheels. With the VWT, you could test if those 90 mm wheels really are that much faster than 60 mm wheels, so you can make the best trade-off between aerodynamics and control in crosswinds. 5-10 minutes with the right hydration setup. With the VWT, you can compare different options for your between-the-arms bottle (in some cases it may be faster to place the bottle upside down! ), the bottles on the seat tube and down tube (these should usually be removed), and the bottles behind the saddles (you may want to compare different angles of this setup, as it can have a big impact on aerodynamics). I want to compare equipment or improve my equipment setup. Can I do this? Absolutely! For some equipment comparisons, like water bottle setup (e.g. comparing bottles on the frame with bottles behind the saddle) you just need to perform an additional scan. For other equipment comparisons, like comparing different wheel profiles, one scan is enough, and the comparison can be done through post-processing manipulations to the original model. I want to see how aerodynamic my position on the bike is and find out if and how it can be improved. Can I do this? Of course! Depending on what position changes you want to compare, this will be done either as two separate scans or as one baseline scan with manipulations done in post-processing. In general, smaller changes that just require stretching the 3D model a bit can be done as manipulations of the original baseline scan. Up to two additional manipulations can be added for 30€ per manipulation. Pricing and what you get is per person. Group of at least 4 people required. Do you have any questions about the Virtual Wind Tunnel service or want to know if it is right for you? Contact me on mikael@scientifictriathlon.com and I'll be happy to help you out.